Locus Sonus streambox system is a distribution of Linux for Raspberry PI computers. We provide the targeted kernel and software support for live audio streaming for our soundmap project. Synchronised with your locustream soundmap account. High quality mono or stereo audio encoder. Ogg, MP3, AAC and Opus audio format support. Works with Wi-Fi or GPRS/3G/4G, ethernet and USB tethering networks. Cirrus Logic/Wolfson audio card support. Works with all Raspberry PI devices. Administration via a simple web browser interface on your local network. Multicast DNS support, for an easy access on the same network. SSH/SFTP access for advanced users. Minimal Linux system without user interface for hight performance. 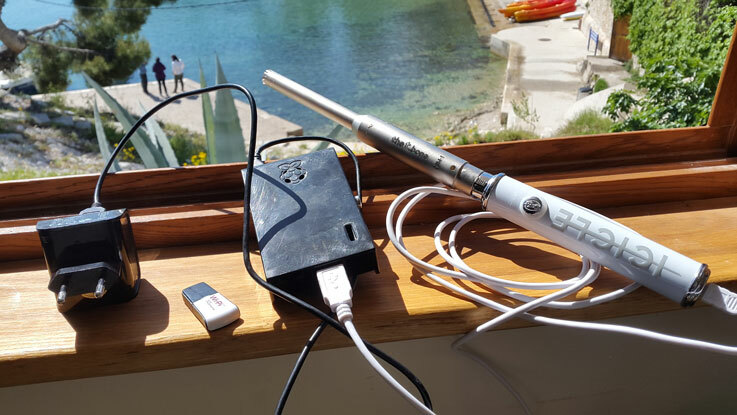 To set up your Raspberry PI as a stream box you will need some audio equipment. For a mono stream, we use a Blue Microphones Icicle XLR to USB Mic Converter/Mic Preamp and the t.bone MM-1 measuring microphone. For stereo streams we use the Midi tech Guitarface II with 2 tbone (or another couple of condenser mikes. Or you can use two mono Usb interfaces (Icicle for example) which can be combined as a stereo interface in settings. We have now configured for the high quality Wolfson and Cirrus logic audio cards. First download the operating system that corresponds to your Raspberry Pi from one of the links above. 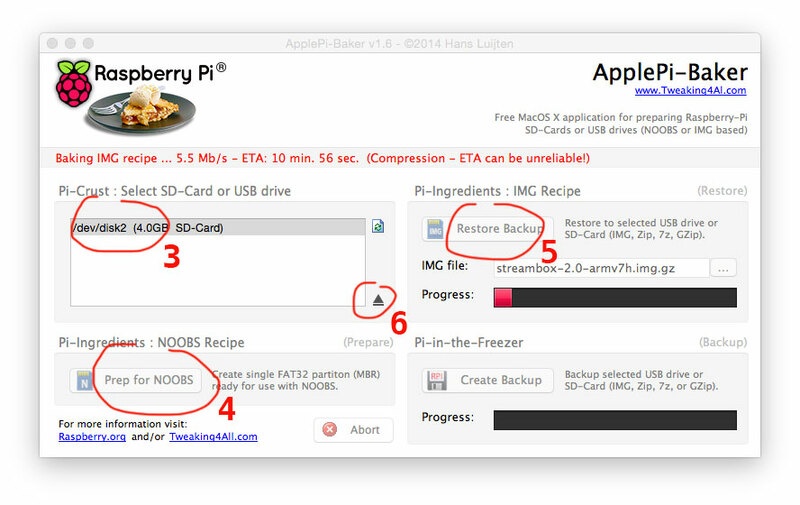 If your personal computer is a Mac we suggest that you use this simple application ApplePi-Baker to format your SD card (minimum 4GB). For Windows or Linux users, refer to the Advanced or command line installation section below to flash your SD card. Check that your card is unlocked (the small tab on the edge should be pushed forward in the direction of the copper contacts). Insert your SD Card into your Mac and open ApplePi-Baker. The card should appear in the "Pi-Crust" menu window with something like /dev/disk2 (8GB SD-Card). Be sure that you have the correct volume; if in doubt remove the card and refresh the list by clicking on the update icon, reinsert and repeat to be sure that the volume disappears and reappears. Next click "restore backup" and select the image file you downloaded (e.g. streambox-2.0-armv6h.img.gz). There is a short delay after you have selected you image then the progress bar should indicate what is happening. When the image is copied (roughly 10mins), eject your sd card and put it (upside down) in the Pi’s SD card slot. Once the card is installed plug the Pi into your network with an ethernet cable, plug in your USB audio interface and connect the pi to its power supply. Then, on your personal computer (it must be on the same network) enter http://streambox.local/ in the web browser address bar. This will take you to a menu which should be self evident. Click the start button in the Stream Status section and you should be streaming. NB : If you should need to shutdown or restart the PI, do it from this interface (in the System Management section) rather than unplugging power. You can access your streambox from anywhere via the internet. This will allow you to adjust parameters and even to restart your streambox online. To do this you must first check "turn on remote access service on boot" in settings when you set up your box via streambox.local. Disclaimer - be aware that by doing this you are opening an access to you local network (albeit a secured one). You can then copy and paste the Admin interface (http) address into your browser or SSH access into a terminal and access the box directly. Insert your SD card into a computer (after making sure that it is unlocked - the little tab pushed forward). Open the volume (double click) and look for the streambox.txt file. Enter you login and password (make sure your " " remain and appear as above (simple text on OSX tends to auto correct to a different character this can be changed in preferences). Continue to scroll and inform audio settings (if necessary). If the streambox is to be used via WiFi you should enable by entering yes and provide the network name (SSID) and Password (KEY). This will be enough for most domestic Wifi networks if not check the indications on your router or ask your network administrator. All other parameters can also be configured via this interface but once you are up and running it is probably easier to do this via the web interface (see above). Save your the streambox.txt file, unmount the volume put it in the stream box and plug in. 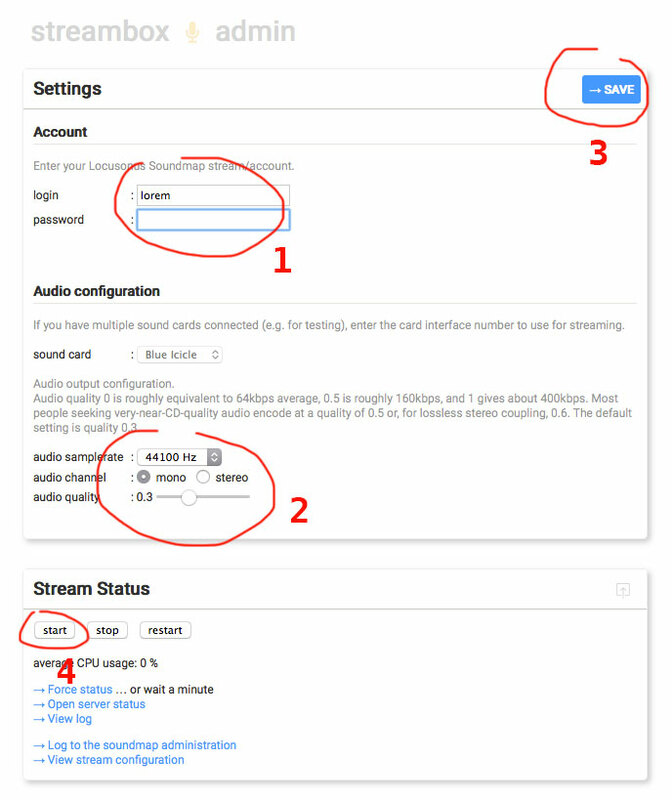 If your computer does not support Multicast DNS or zero configuration networking, or if you are not on the same local network (your streambox is behind another router, or behind your smartphone network, a global network, etc), the streambox.local address can not be reached. As an alternative you can also use the streambox's IP address directly. Ethernet and USB tethering are always enabled (using the DHCP protocol by default). To find your streambox address and edit your configuration from your Androïd browser, use a network scan application. If you need a static IP address, configure the appropriate network in the Setting section. Except the web interface released under a Creative Commons Licence BY, the streambox system is distributed under the terms of the GNU General Public License, version 3, as published by the Free Software Foundation. THIS PROJECT IS DISTRIBUTED IN THE HOPE THAT IT WILL BE USEFUL, BUT WITHOUT ANY WARRANTY; WITHOUT EVEN THE IMPLIED WARRANTY OF MERCHANTABILITY OR FITNESS FOR A PARTICULAR PURPOSE. SEE THE GNU GENERAL PUBLIC LICENSE FOR MORE DETAILS.